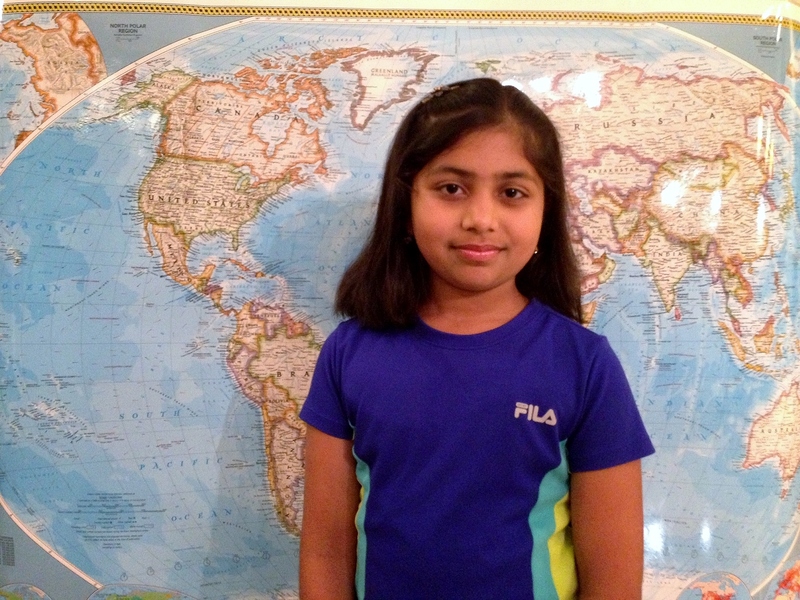 Quarry Lane School (Dublin, California) 5th grader Rhea Mitr competed with geography enthusiasts from across the state of California on April 5th in Sacramento at the 2013 California National Geographic Bee. Out of the 109 state semi-finalists, after the preliminary rounds, 29 contestants had a perfect score (including Rhea). All of them were on the stage and faced 20 rounds of tie-breaker questions to narrow down to the top-10. The top-10 finalists had a long face-off before coming down to the top-3. Rhea missed 2 questions and that put her along with another contestant to battle for the 3rd place. Between the two of them, they had another 7 rounds of tie-breakers before Rhea finally emerged to secure the 3rd place. Rhea was awarded a certificate, a check for $50 and a complete National Geographic set of videos and magazines for the last two decades. Rhea received special recognition for being a 5th grader and for being the top scorer among girls in the last 25 years. Rhea Mitr “My journey began back when I was 5-years old. I used to be intrigued by looking at the globe and learning some fun-trivia. Subsequently, I tried to explore the breadth of information, starting with political geography and physical geography. I soon realized that I had a drive to learn more about the world than just maps. I delved down deeper into other elements such as current events, society, cultural values, climatic patterns, etc. I enjoy the trips that I take with my family, both local and abroad. These traveling experiences have enriched my knowledge and reinforced my passion. “After winning the National Geographic School Bee (at Quarry Lane School), I ramped up my preparation and gave my best in the written state-qualifying exam. I was excited when I made the state-cut. I worked harder in preparation for the State Bee, knowing that California would be a very tough state to compete in. My family supported me throughout by helping me chart out a good study plan and making sure that I had the necessary resources.